This is day 5 of our week-long series discussing taxes and migration, and responding to the Center on Budget and Policy Priorities’ Michael Mazerov’s new paper on the topic. Read part 1 here, part 2 here, part 3 here, and part 4 here. In a long series of tables and state-to-state comparisons, Mazerov lays out an argument that the migration flows between high-tax states and low-tax states are, contrary to public perception, actually quite similar. For example, he cites that 68.3 percent of the households moving out of New York will be replaced by households moving in, and offers a similar statistic for other states with net outward migration. Unfortunately, he doesn’t provide the data for states with net inward migration. He also doesn’t provide information on how much income migrates; and in fact doesn’t even show the actual population changes, just the number of “households,” which may vary in size. These omissions are particularly odd as, in the paragraph right above the incomplete chart, he says it’s important to look at “all of the available migration data” (emphasis Mazerov’s). This could lead to readers getting the wrong idea that differences among state migration patterns are small. In fact, that is exactly what Mazerov does claim, when he says “As it turns out, net migration in most states is indeed quite small compared with total or gross migration” (emphasis Mazerov’s). The differences between states are also made clear when this data is presented in map format, which shows the states that are clear outliers in terms of net inward or outward migration rates. As can be seen, and as I explained in my earlier post about the actual scale of migration, net migration varies widely. For every 2 people who leave New York, only about 1 moves in. Outward migration is almost double inward migration. On the other hand, in Nevada, for every 2 people who leave the state, about 3 move in. These aren’t “quite small” values. These are demographically significant changes amounting to literally millions of people. But Mazerov has a point when he says that for most states, net migration is small. The specific values I mention are extremes. But for policymakers, the essential question is: what makes a state an extreme? Consider the 4 states and the District of Columbia that have the largest net outflows of people: New York, California, Illinois, Michigan, and DC. They don’t share many climatological features. California has arguably the best climate in the nation. DC is hardly a frozen tundra. Illinois, New York, and Michigan can get cold, but New York City is not cold in the same way that Chicago is. Climate, then, doesn’t seem like a good explanation for these outliers. Maybe anemic job growth explains these states’ problems. But even that seems difficult to justify, because the 1990s saw strong job growth in California, and the late 90s and 2000s also saw a revitalization of New York City. Michigan was suffering through the decline of Detroit, but Chicago has not seen a similar decline. The DC metro area, meanwhile, has an extremely robust job market. Is quality of life terrible in Los Angeles, Chicago, San Francisco, New York City, and Washington? That hardly seems plausible. So what motivates these exceptional patterns of outmigration? No doubt many things. Many of these states share a high cost of living along many categories, especially housing, as Mazerov notes. But one variable we suggest would be, obviously, taxes. Our State-Local Tax Burdens report has back-cast statewide tax burdens to 1977, thus can be a useful tool for seeing if these states actually had high taxes historically. A quick check reveals that all of these exceptional out-migration states have generally had higher-than-average tax burdens. Michigan and Illinois are nearest the national average, while the District of Columbia has quite recently fallen below it. But certainly none of them could claim to be low-tax jurisdictions. So high taxes seem like a reasonable candidate for one factor that can motivate out-migration. What about exceptional states on the high end? 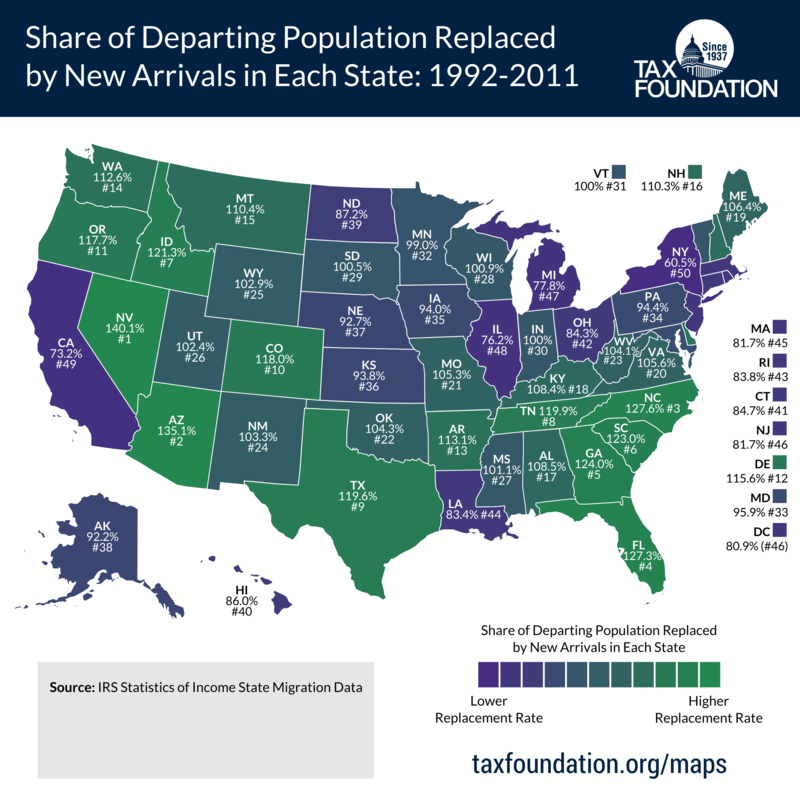 Since we assessed all the states with less than 80 percent replacement of out-migrants, it makes sense to look at the states that have over 120 percent replacement. Most of those states are southern or southwestern states, so climate may matter. Idaho is the only climate outlier. Job growth probably matters as well, as many of those states have seen strong growth in the last 20 years (though, again, job growth itself may be affected by taxes). On the whole, these high-inward migration states tend to have lower tax burdens. North Carolina and Idaho have periodically had higher than average tax burdens, but most, like Tennessee and Nevada, have consistently low tax burdens. Again, this doesn’t conclusively prove that taxes drive migration, as no doubt other living costs are lower in these states too: but it does suggest that taxes cannot be discounted out of hand. In sum, we can’t conclusively say that lowering taxes will suddenly attract a tide of migrants. The connection between taxation and migration suggests that taxes affect migration on the margin, mostly impacting it through supporting economic growth and motivating upwardly mobile individuals. State policymakers are right to be concerned about migration in relation to taxes. But they should be careful to clearly explain that the main economic effect of better tax policy isn’t directly on migration, but on broader economic growth. Net inward migration is a positive side effect of economic growth and better tax policy (insofar as tax policy promotes growth), and shouldn’t be the fundamental goal of tax changes.